As seen on TV! The reusable single brew cup you fill with your own coffee! Did you avoid buying those fancy new Keurig single-serve coffee makers because the cost of those disposable cups seemed too high?? Save Money and Enjoy Your Favourite Coffee! Stop spending a fortune on single-serve coffee pods. 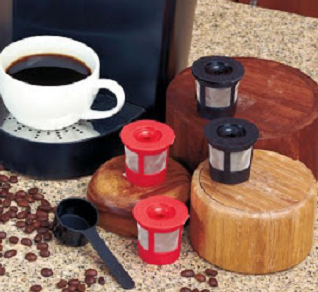 Café Cup is the reusable coffee cup pod that you can fill with your own favorite coffee – as many times as you want! Enjoy the convenience of a Keurig single serve coffee maker at a fraction of the cost - brew delicious coffee, espresso, tea or cocoa for just pennies per cup. I also found the Café Cup on Amazon for $16.99 and ShowCase has it for $19.99! -- only comes with one cup and you have to remove the Kcup holder from the machine and replace it with the reusable filter. When you buy the Café Cup you get 4 cups to use or share - AND you can leave the original holder inside - no taking the machine apart to install. You can even still use regular K-cups those times when you're in a hurry and/or want to use a regular K-cup. PLUS - The Café Cup distributes the water evenly through all of your coffee grounds - maximum use - no waste! 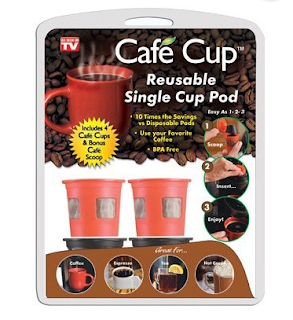 Easy to Use - Simply fill the pod with your favorite coffee, pop it in your single serve coffee machine and brew! Easy to Clean - When you’re done, just rinse or throw it in the dishwasher! Keep one at home and one at the office! Click to order your Café Cup today! NOTE: The Café Cup is only compatible with Keurig K-Cup machines. Café Cup is not compatible with Tassimo, Nespresso, Krups, Dolce Gusto, or Keurig VUE models.